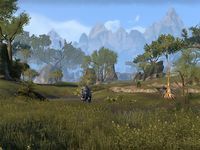 Valenwood borders Elsweyr to the east and Cyrodiil to the north, partially divided from the latter by the Strid River, and is just across the sea from Summerset Isle. Its landscape consists mainly of rolling hills and light blue rivers, predominantly covered in rainforest and woodland. Valenwood consists of four main regions: Grahtwood, Greenshade, Malabal Tor, and western Reaper's March. Grahtwood is the southeastern region of Valenwood. It borders Greenshade to the west, Malabal Tor and Reaper's March to the north, and Elsweyr to the east. The Padomaic Ocean is off its southern shores. Its capital is Elden Root, a city built on and around the Elden Tree, an ancient and massive graht-oak. The other major cities are Southpoint and Haven on the southern shores. The ruined city of Gil-Var-Delle, famous for being destroyed by Molag Bal in the First Era, is also located here. The region is covered in a dense jungle containing many massive graht-oaks, from which the region takes its name. Greenshade is the southwestern region of Valenwood. It borders Grahtwood to the east and Malabal Tor to the north; the isle of Auridon is just across the sea to the west. The main city is Woodhearth, situated on the westernmost tip of the region. The other major cities are Greenheart and the Altmeri city of Marbruk. Some Bosmer of this area consider themselves subjects of the mysterious Wilderking (or Wilderqueen), who resides in Greenheart. The region consists of smaller forests, clearings and meadows; there is also a swamp to the southeast of Woodhearth. Malabal Tor is the northwestern region of Valenwood. It borders Greenshade to the south, Reaper's March to the east and the Gold Coast of Cyrodiil across the Strid River to the north. The region contains the city of Silvenar, the spiritual center of Valenwood, and is also home to the summer site of Falinesti, where the city is located on most maps. The region is covered in a jungle similar to the one in Grahtwood, but smaller in scale. The western portion of the Reaper's March region, known as the Northern Woods, makes up the northeastern reaches of Valenwood. 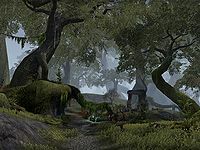 It is a sparsely forested area that borders Malabal Tor to the west, Grahtwood to the south, and Elsweyr to the east. The biggest settlement is the multicultural city of Arenthia. Due to the close proximity of Cyrodiil and Elsweyr, the region was often raided by the Colovians and the Khajiit. For the same reason, both Colovian crypts and ruins of Khajiiti temples can be found here. 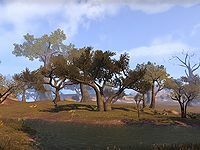 The forests of the Northern Woods gradually diminish as they merge with Elsweyr's savannas to the east, which comprise the subregions of Dawnmead and Jodewood. Valenwood, as a jungle, was home to some quite interesting creatures. A Pocket Guide to the Empire gives a list of these: "Before man or mer came to Valenwood, it was home to a salmagundi of creatures and strange civilizations. Centaurs, hippogriffs, satyrs, minotaurs, giants, basilisks, fairy folk, hydra, and intelligent apes all flourished there before the first Aldmeri stepped onto its shores." Like all Elves, the Aldmer had to adapt to their environment, and they became the present day Bosmer. 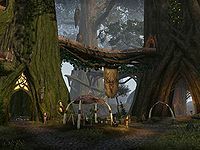 For the support of Y'ffre, in helping them adapt, the Bosmer promised not to harm the forest. The first king of Valenwood, who started the Camoran Dynasty, was King Eplear. He succeeded in uniting the wild Bosmer. He also welcomed other races, especially the Ayleids, who fled from Alessia's slave rebellion. In 1E 340, he also welcomed the Empire, agreeing to a trade treaty with the now Ayleid-free men. However, the prophet Marukh's controversial teachings would bring tension between the Camoran Dynasty and the Empire. As a war was brewing, Valenwood killed Skyrim's king, Borgas, in a Wild Hunt, putting the Nords in turmoil for fifty years. The reign of Empress Herta only intensified the conflict between Valenwood and Cyrodiil, as she improved Cyrodilic relations with the Colovian West. In 1E 2714, weakened by warfare and a plague from the Sload of Thras, Valenwood fell to Cyrodiil. The Empire then gave independence to each city of Valenwood, so they would not unite against Cyrodiil. The Bosmer were loyal to Cyrodiil, until the last Akaviri Potentate died in 2E 430. The Camoran Dynasty tried to reestablish power, but failed, due to the cultural differences of each city. 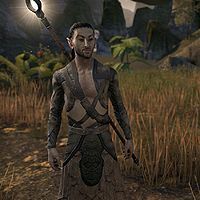 Without any main power, the Bosmer warred those around them, such as the Khajiits of Elsweyr, the Colovians of Cyrodiil, and in some cases, each other. Distracted by their quarrels, they were easily defeated by the Maormer of Pyandonea. Stability and relative peace finally arrived once Valenwood joined with Summerset Isle and Elsweyr to form the first Aldmeri Dominion and adopted a new government they called the Thalmor under the leadership of Queen Ayrenn. Valenwood was also a part of the second Dominion, which reigned until the closing years of the Second Era. When Tiber Septim absorbed Valenwood into the Third Empire during the Tiber Wars, he allowed the Bosmer to keep their city-state governments and a Camoran king. For fifty years the Bosmer were stable until they began to feel annoyed at the Imperial government they were under. The Camoran Usurper rose up during this time, and recruited those who supported him, and killed those that opposed him. He attacked Cyrodiil, and the Bosmer were under his rule for 20 years until they gained the courage to leave his power. Valenwood no longer trusted other races, and isolated itself from the Empire. The Bosmer also started to return to traditional types of living, by surviving in the forest, they could keep away from the hectic political world, and many did. They still were attacked during the Imperial Simulacrum, by both Elsweyr and Summerset Isle, the latter of whom they once called ally. At the end of the Third Era, the political system of Valenwood was in shambles, with the tribal council not having met in decades, and most decisions taken within families or clans. As the government weakened, other forces seemed to stir. The Wild Hunt was sighted for the first time in five centuries, and a Bosmer prophet known as The Precursor arose. He preached that Y'ffre, the Forest God, was "returning with new gifts for his favored people." In 4E 29, Valenwood's Imperial-friendly government was overthrown in a Thalmor-backed coup. Bosmer loyalists and supporting Imperial forces were subsequently defeated by better-prepared Bosmer troops aligned with the Thalmor. In the aftermath, Valenwood's new government proclaimed a union with Summerset Isle, now known as Alinor, and the third Aldmeri Dominion was formed. Bosmeri cities are usually located on the branches and in the trunks of the graht-oaks, with some individual tree-houses on the forest floor. The Green Pact does not allow the Bosmer to shape the trees in the traditional way, so instead Bosmeri Pod-Singers magically persuade Valenwood trees to grow into houses. However, Valenwood does not consist only of the Bosmeri tree-cities. Some of the cities are built in other architectural styles: for example Haven and Marbruk are primarily Altmeri, Southpoint is Colovian, and Arenthia is a mixture of Colovian and Khajiiti styles. Valenwood is also dotted with numerous Ayleid ruins, built by Ayleid refugees from Cyrodiil. In the northeastern part, old Khajiiti temples can also be found. Valenwood's sub-tropical climate supports a great wealth of flora, which often grows to enormous proportions. 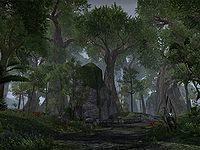 The Green Pact forbids the Bosmer to harm the plants, so they grow uncontrollably, resulting in wild, dense jungles and forests. 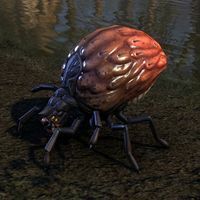 Valenwood's lush environment is home to many creatures, for example monkeys, antelopes, giant wasps, thunderbugs, spriggans, crocodiles and tick-like hoarvors. Timber mammoths inhabit the Greenshade and Malabal Tor areas, while senche-tigers are common in Reaper's March (though they also appear in other regions). A multicultural city in Reaper's March, near the border with Cyrodiil and Elsweyr. A location that existed in the late Second Era. A sacred forest known as the birthplace of the First Tree. An ancient city in central Grahtwood. A city in northern Malabal Tor and the traditional capital of Valenwood, it formerly migrated between four sites depending on the season. A town located in eastern Grahtwood that was razed by Molag Bal. A city in southern Greenshade, near the shore. An Altmeri city in southeastern Grahtwood, near the shore. An Ayleid ruin containing the Heart of Valenwood. A major Altmeri city in eastern Greenshade. A hidden forest between Malabal Tor and Reaper's March ruled by Selene, a mysterious forest spirit. A city in eastern Malabal Tor, the spiritual center of Valenwood. A port city in southwestern Grahtwood founded by a cohort of Imperial soldiers in the early days of the Second Empire. A port town in western Malabal Tor. A city in eastern Greenshade destroyed by the forces of Mehrunes Dagon. A city in western Greenshade, near the shore. This page was last modified on 4 January 2019, at 01:38.